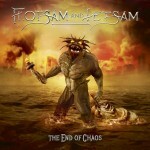 Share the post "Album review: FLOTSAM AND JETSAM – The End Of Chaos"
My infatuation with Flotsam And Jetsam and their unique brand of Metal began sometime in the late fall of 1988 – that is when, while watching a late-night episode of the now legendary, Baily Brothers presented, Headbanger’s Ball, I came across a truly amazing video. In that video, the Arizona-based Thrashers were banging their heads to an outstanding cover of Elton John’s classic tune “Saturday Night’s Alright For Fighting” – one which guided me towards purchasing their then latest album “No Place For Disgrace” and helped forge a love affair between myself and the band which lasts to this day. Since then, quite a few changes have taken place in the Flotsam camp, both in terms of personnel and musical direction, but one thing always remained the same; the band’s ability and need to offer the Metal community with passionate, honest, and thematically impressive music. It is this very need which continues to inform and motivate the quintet to this day and which led to the creation of this brilliant-sounding, twelve track opus entitled “The End Of Chaos”. So, what is it that makes “The End Of Chaos” such a special album? Well, simply put, all the compositions contained therein are cleverly-structured and truly bursting with massive-sounding riffs and highly addictive melodies that the average Metal fan can most definitely sing along to. Furthermore, the album features the services of one Ken Mary (drums – also Fifth Angel) who, together with, Michael Spencer (bass) form a rhythm section of immense skill and quality – one which not only presents each and every composition with the solid foundations needed to flourish upon but also one which massively contributes, both in terms of mood and flavor, to the overall proceedings. Now, add to all that the exceptional sound quality achieved with the assistance of the Danish producer/wizard Jacob Hansen and what you get in result is nothing less than sheer brilliance. No other composition could offer a better introduction to this album than “Prisoner Of Time” – a four and a half minute up-tempo Thrash monster featuring one of Eric “A.K.” Knutson’s most inspired vocal deliveries, a flamboyant solo by guitar maestro Michael Gilbert, as well as a killer bass line by Mr. Michael Spencer. Ken Mary’s unique drum skills, already manifested on the opening track, are further showcased in the follow-up “Control” – an equally fast piece whose twin guitar work, courtesy of Michael Gilbert & Steve Conley, provides clear evidence of the band’s strong affiliation to all things Iron Maiden. “Recover” is another classic-sounding piece whose epic/groovy riffs and outstanding vocals will be discussed by Thrash metal aficionados in the years to come while the duet “Prepare For Chaos” / “Slowly Insane” indulge in a healthy competition which does not result in a clear winner, as they both feed on equally massive riffs and brilliantly crafted guitar solos. If you are still not convinced by Ken Mary’s personal contribution to this album (note: you should check this with your doctor, really), all you have to do is simply observe how expertly his drum fills support the outstanding riffs in “Architects Of Hate” and how the massive wall of sound that he assists building in the classic-sounding mid-tempo “Demolition Man” serves the album. “Unwelcome Surprise” is another enjoyable riff-based piece that forges a great partnership with the equally energetic “Snake Eyes”, leaving the four minute groove-laden “Survive” to offer the best opportunity for those interested to indulge in the ancient art of head-banging. Fans of high speed guitarwork will find many things to appreciate in “Good Or Bad” while the closing three and a half minute “The End” is nothing other than an ode to 80s-sounding, riff-based Thrash – a perfect ending to a truly outstanding album. Preparing this review took much longer than I originally anticipated and that was deliberate on my part, as I wanted to make sure that the sheer excitement I felt when listening to the album the first couple of times was truly justified. Many weeks and many, many spins later I can safely say that “The End Of Chaos” is one of the best albums ever released by this, sadly, criminally underrated band! It may be true that it is the Big Four (Metallica/Megadeth/Slayer/Anthrax) who hold the reigns of the Thrash Metal scene world-wide, however, the fact remains that it is the second-tier bands such as these lads here, Death Angel and Testament who continue to make sure that the goods are well and truly delivered. Flots ‘till Death? You bet! This entry was posted in ALBUM REVIEWS, PURE METAL (All posts), Pure Metal/Album reviews. Bookmark the permalink.